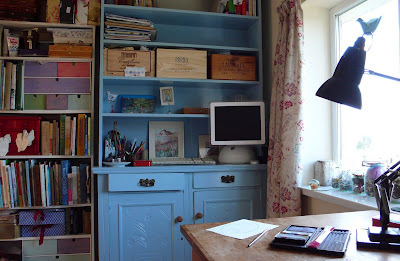 In a new tidy work room, there was a nice new blue shelf. And on this nice blue bright shelf, there stood an old and slightly battered liberty box. In this old and slightly battered liberty box, there was cotton and some felt and some paper. from the cotton and felt and some paper; a body started to take shape, with some adjustment and some trails and errors, came up with a pattern. From this new little paper pattern, came a captain Rupert prototype doll. 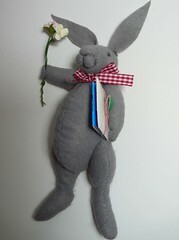 I had wanted to make a rabbit doll for a very long time. I have never made my own pattern before, and up until now for some reason, I could not get it to work. 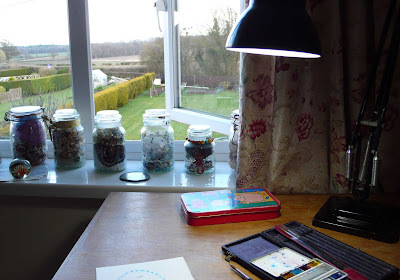 It must be the tidy workroom, I'm starting to feel more organised. With a few alterations the finished Captain Rupert. I watched him hop down the garden path, through the gap in the gate. He stoped to pick some flowers, I thought that's funny his not nibbling them. In his arm he held a bright blue book, and a card. 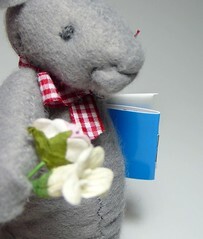 I think he took the book to read on his journey and in the envelope was a card, it must be to give to the kind person who has invited him to tea, along with the lovely bunch of flowers. I put the very first Captain Rupert Doll in the etsy shop and in no time at all much to my amazement, he sold. So I won't be seeing Captain Rupert bouncing back through the garden gate. This made me feel very said, the first Captain Rupert doll was very special to me and I really wished I had kept him to myself. I know though he has gone to a very very nice home and will be very much looked after and taken care of, maybe even given a slice of carrot cake, this makes me very happy. I just hope he will behave himself, and not get up to too much mischief. Captain Rupert and I have been lucky enough to be given yet another award by alison. 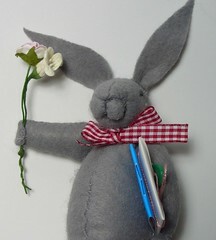 I still need to work out how to get the award image onto the blog, I'm sure its very simple, please tell me, thank you. Our house has slowly been getting sorted out over the last year, since we moved in. Its a tiny house and storage space is very important. First we built shelves to house all our books, (well some of). We boarded the attic, and build a huge wardrobe. We put storage boxes under the beds and reorganised the kitchen. It all left on very major problem, my work space. Why it got left to last I can't imagine, Captain Rupert even thought it was so bad he refused to enter it. I think I have now sorted most the problems with the room, by adding this dresser. The base is old the top K built for me out of mdf. I was a little fussy. I wanted a dresser but I searched for on the right size, I could not find one with big enough shelves to hold things. This dresser is great, the shelves can hold wine boxes. What brilliant storage wine boxes make I very much recommend them. The cupboard at the bottom houses my printer and scanner and hides all the wires. Which is very good, as if captain Rupert chooses bother himself and visit me in my work space, he won't be tempted to chew any wire. 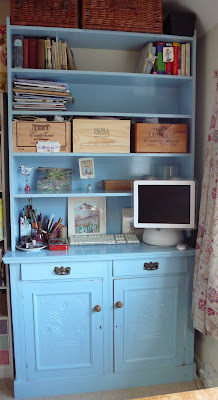 I have a space for the PC at on end of the desk and I can paint or do other jobs that need to be done at the other end. Its so much better as I can tidy things away, in real places rather than the boxes that were stacking up around me. And if I look up from my work, and look carefully. 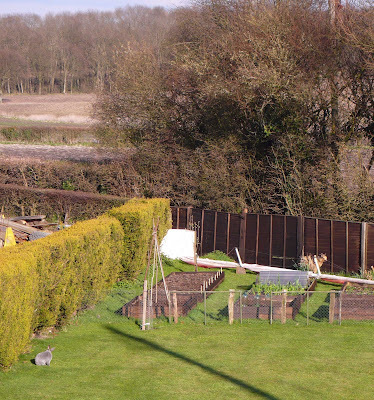 I can spot captain Rupert enjoying the sunshine in the garden, what a nice life he has. Oh his having a wash down by the veg patch, (bottom left). Captain Rupert and I have been very pleased with how his giant postcard sets look all packaged up with a story on the back. They are now available here. I have been thinking about some new ideas, Captain Rupert and I have been out and about in the village catching some thoughts, images and ideas. We thought we might hold a boat race next. 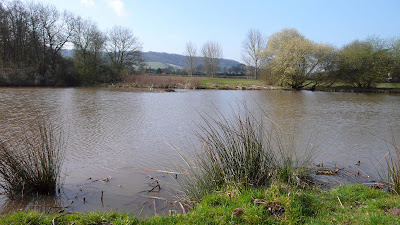 Watch out for they boat race, to be held soon, location the village pond, please bring a picnic, it should be a great afternoon, boat races, competitions, cakes, fun, excitement. In no particular order, just as I glance over, I can see. Antiques of the garden, I love gardens, and would wish to have interesting finds in mine, antiques are out of my price range, but I like to get inspiration for things to go into may paintings. Encyclopedia of Needle craft I have several needle craft books, I would like to think if I studies them I would be better. Readers Digest things to make and do - I used to spend hours and hours pouring over this book when I was little. The pages with how to make wonderful dolls houses and furniture are my favourite. Why does my rabbit? A very useful book on understanding your rabbit. A while ago I was tagged by 3 blessings aday for 5 facts, I turning that into 5 objects on my shelves so here goes. An old liberty box, containing my Patten and cutting for the prototype captain Rupert doll. Pencils, Paint, Brushes and my lovely new paint brush, hand made by Rosemary and co brushes. 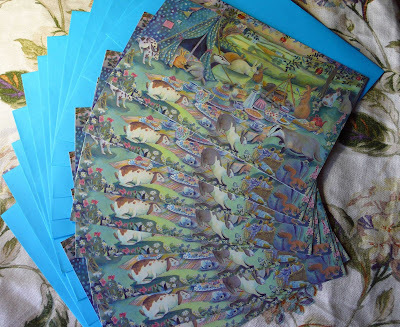 New Captain Rupert cards, well they look so pretty, even if I do say so my self. And we have been lucky enough to receive an award (You make my day award), we like getting awards from Louise. I just need to figure out how to post the picture, I think I might put it in the side bar. Tags and awards I should pass, on but there are so many lovely blogs, I always chicken out choosing.